Most people set goals for their lives. Some of those goals are personal ones— find a special someone to spend his or her life with, have children, reconnect with estranged family members, or build stronger friendships. Other goals are professional— complete a specific course of study, graduate with honours, get promoted at work, find a better job, publish a book, or start a business. Often, people find themselves in a stagnant place in their lives. They may feel stuck in the same cycle of eat, sleep, and work, every day; and in the process, they lose sight of their life goals. One way to reclaim those goals and turn them into reality is to invest in yourself, to make a positive change in your life that others will notice. Your smile is a good place to start. Studies show that your smile has a huge impact on the people you meet. They tend to form a negative or positive impression of you, partly based on your smile and the way your teeth look. Crooked, stained teeth tend to turn people off. They may get a bad impression of someone naturally and assume the person does not who care for themselves properly. In contrast, a white smile with straight teeth gives people the impression of success and power. They’ll see you as stronger, more successful, happier, and more educated. When you invest in yourself and improve the appearance of your smile, people around you will think better of you without even realising why. If you have suffered for years with crooked teeth, stained teeth, or unsightly gaps in your smile, you are probably conscious of it all the time. For many people with these issues, the problems prevent them from smiling broadly in pictures. They may speak carefully, keeping their lips covering their teeth as much as possible. They may avoid public speaking or social interactions because they feel self-conscious. Perhaps you feel insecure and self-conscious as well. What if you could have straight teeth that look white and healthy and natural? Imagine what that kind of smile would do for your self-esteem. You would stand taller and walk with more confidence. You would feel emboldened to talk to people and empowered to do things that you never felt comfortable with before. Imagine how much could change for you, professionally and personally, if you had an extra dose of personal confidence. Changing your smile can be the beginning of bigger and better changes in your life. If you’re interested in a full smile makeover, contact Orchard Scotts Dental. As an established dental clinic in Singapore, we offer Invisalign and a variety of other treatments to correct your smile and make it naturally beautiful. At your first visit, your Singapore dentist will talk with you about a treatment plan that is customised for your needs, designed to achieve the results you want. 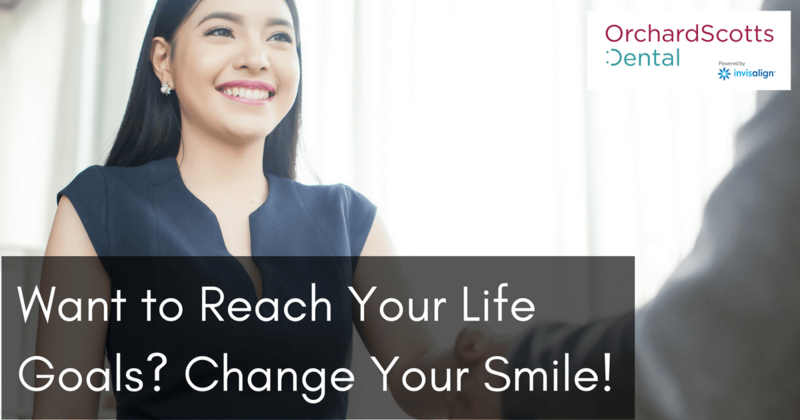 In a matter of months, you’ll go from hating your teeth to loving your new smile.